(Newser) – Two American college students have died in a tragic boating accident while studying abroad in Denmark. Linsey Malia, 21, of Easton, Mass., and Leah Bell of Covington, La., were killed Saturday when a jet ski crashed into a boat carrying them in Copenhagen Harbor, reports Mass Live. 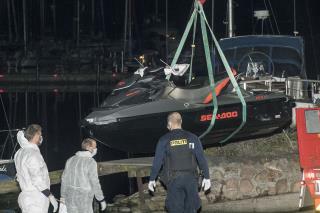 Six others, including at least five boaters, were treated for injuries at a hospital and released, reports the Copenhagen Post, which adds it's illegal to ride jet skis in the harbor. Several people were seen trying to flee the scene on jet skis after the crash, but police say nine people are now in custody, including a 24-year-old man arrested on suspicion of aggravated manslaughter, per the AP. The students were celebrating the end of the spring semester and were to return home over the next week. Given the frequently outrageous behavior of jet ski operators, on lakes, inland waterways, and on the open ocean, I say ban the machines altogether. When their "fun" costs other people their lives, which it often does, its time to put a stop to it. No need to ban them. Speed limit them to 6 knots within sight of land. It seems tragic they died just before coming home. That does not mean they would have been safe in the USA. Being college students they may have died they weekend after they returned home at a frat party.